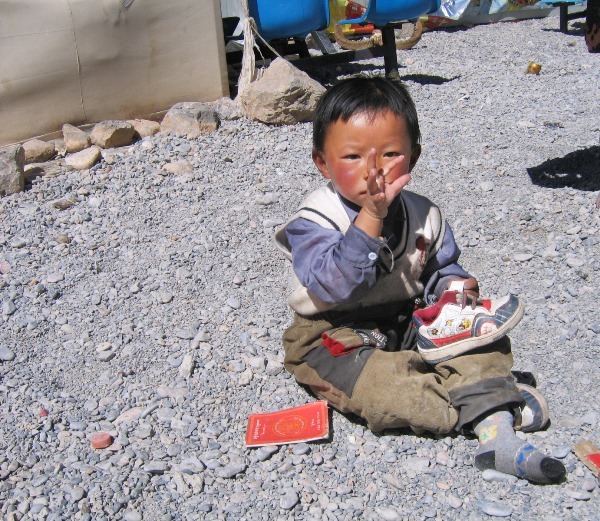 This image is my personal favourite of people of Tibet. I love how the tourist is walking in one direction and the old lady with the prayer wheel is approaching me. She’s looking at me curiously but is also frowning. Or that might be the wrinkles, what do you think? After my recent blog post 7 days in Tibet, I received many reactions from you about this amazing country. And I couldn’t agree more. Tibet is an amazing place with stunning nature and jaw dropping sights to see. But it’s the people of Tibet who truly made my trip around Tibet so memorable. 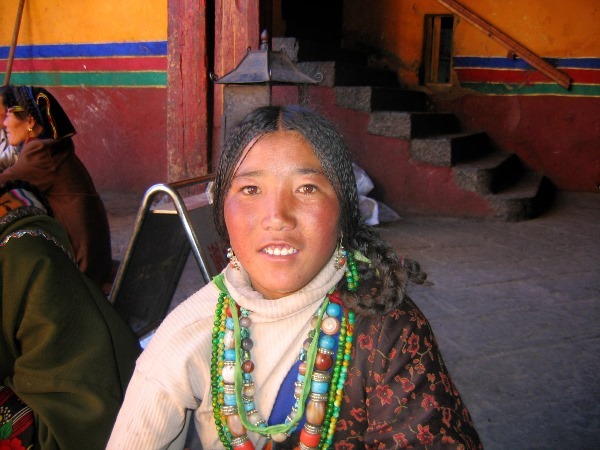 Tibetan people are mystical and their faces tell a story. The story of the people of Tibet is interesting and I tried to capture some with my pictures. I tried to show you a little bit of travel to Tibet, with my blog about how to travel to Tibet for independent travellers and my story about 7 days in Tibet. I got many likes on my Instagram account where I did a “7 pictures of 7 days in Tibet” series and posted 7 amazing images of the views of Tibet. But I posted mainly pictures of the views and sweeping vistas of the Himalaya Mountains. 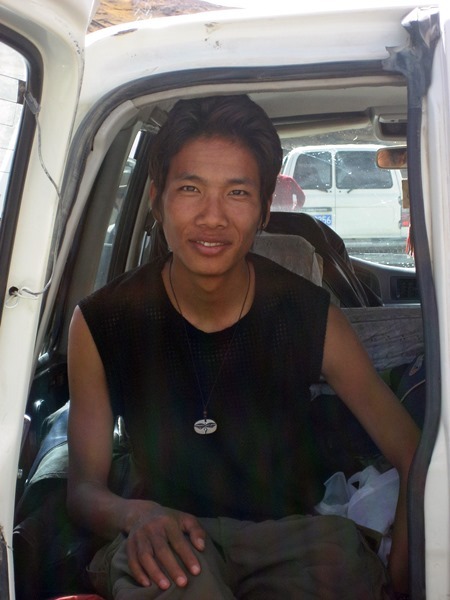 I got many requests for more images of the people of Tibet. So, your wish is my command. I went treasure hunting in my photo files on my laptop and found some real beauties! I sure hope you like them! I know I did. I still remember taking every single one of them and had fun trying to interact with the children. Of course I was nervous asking people if I could take their picture. Who wouldn’t? But I managed to do so a couple of times and came out with some amazing shots of the amazing people of Tibet. I still remember how this young lady and her child were looking at me. I pointed at my camera to ask if I could take a picture of her. She nodded and took her time. She didn’t try to smile, she just looked at me. Afterwards, she was too shy to look at the picture but she did smile at me then. I love how the child is evenly serious as her mother. Looking at each and every one of their faces, you’ll find a story. The children are young and eager to learn. The old people have so many wrinkles in their face it’s like the Himalaya Mountain range on its own. But I won’t keep you any longer. I know you have been asking for them. 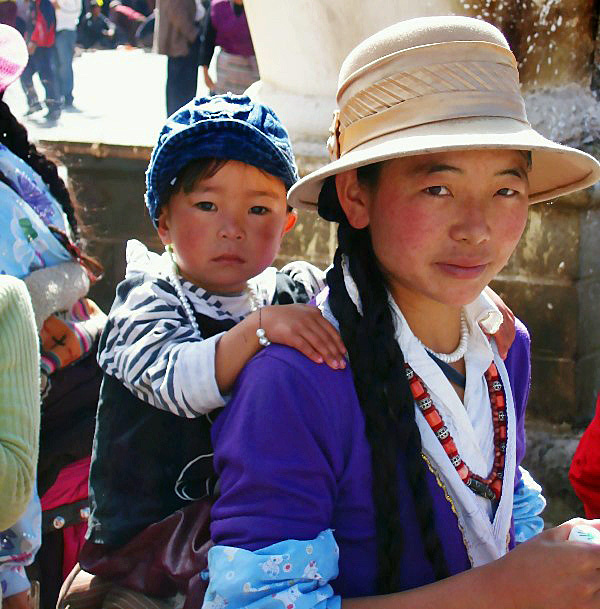 Here are some more pictures of the people of Tibet. Enjoy and let me know what you think! 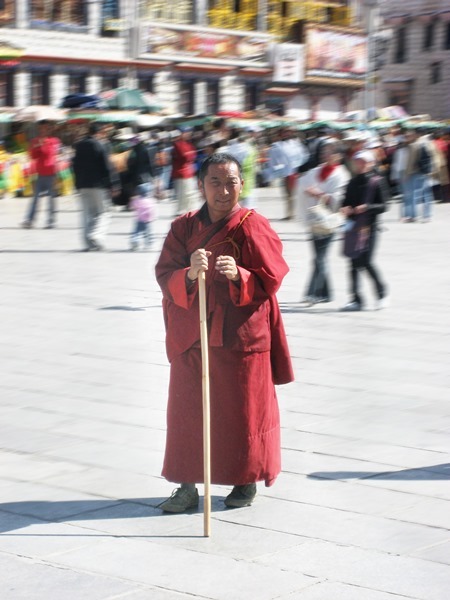 We staid a few days in Lhasa and its main attraction was walking around town and looking at people. And don’t you think I was gawking around, no, I was looking back. For some reason, many women slowed down their pace when approaching me. They looked at me with open faces and tried to catch my eyes. I had never experienced something quite like it but I can tell you it was real. The women seemed curious and a bit shy and I felt like they opened themselves up to me. As you can see below, I photographed mainly women. 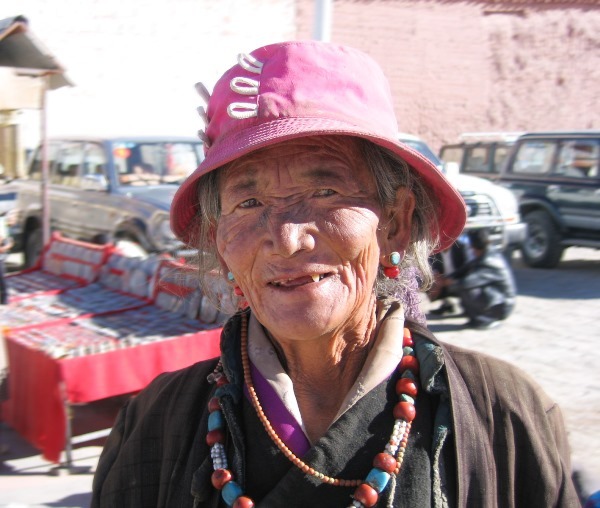 And let’s be honest, women are the most photogenic people of Tibet! People just being busy and doing their thing are the most interesting. I selected some images of ladies at the Barkhor Square. It was a colourful combination of old faces with bright colours. These women were either working or praying. If you want to see more amazing images of Tibet and people in Tibet, check out the Instagram account of my friend Bart van Leersum, who’s a photographer and recently went to Tibet. He inspired me to review my own images of the people of Tibet. These ladies were working and talking at the same time. Nothing could disturb them from their discussion which I like about this image. The image of the next lady was also a great story. Don’t worry, I’ll tell you. I was walking around Barkhor Square, trying to find the entrance to the Yokhang Temple. There was a little girl who guided us to the entrance. This was her mother. She sat there and when we returned from our visit to the temple, she saw me taking pictures from other things around the temple. She touched my arm and suggested I’d take a picture of her! Can you image that? I was a little bit surprised, but loved the open look of this young woman. And look at the hair! 108 tiny braids! 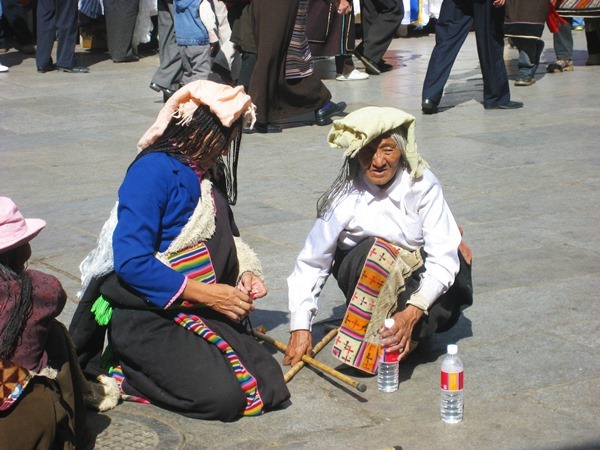 I could have easily staid in Lhasa for weeks, just looking at the people of Tibet and their daily routines. But we wanted to see more of Tibet so we took some tours. We went to Lake Nam- Tso, you can read more about it at my blog post 7 days in Tibet. At the lake, there were many children playing around. This little fellow looks a bit puzzled. We also travelled per car to the border with Nepal. Taking in the stunning scenery along our way. We stopped at a few towns, villages and settlements and met some people on our way during our stops. In Gyatse, we went to see and check out the temple. When we left the temple, this old lady was standing there. She kept looking at me. I didn’t really know what to do. What would you do? I just smiled back at her and looked in her eyes. They were a bit cloudy but still showed me her strength. She agreed that I would take a picture of her. I think this lady truly shows that faces can tell a story. Too bad there wasn’t an interpreter who could translate for us. We were crossing a big chunk of the country by jeep. The people of Tibet were working their fields and bringing in their crops. When we’d pass in our car, we slowed down and the people would normally look up and try to see who was in that car passing by. Here we were at a pass overlooking the mountains. 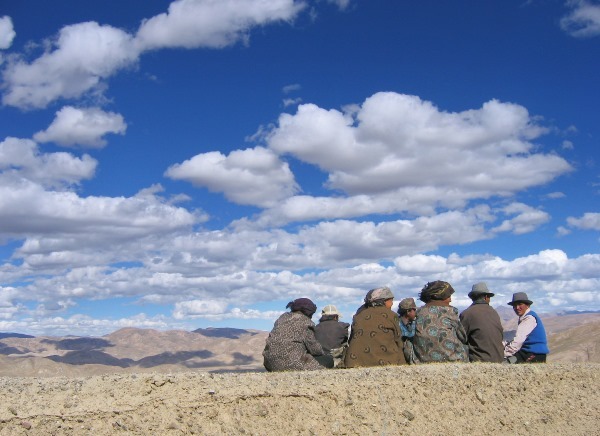 This group of Tibetans were taking a break from their labour. I wish my breakroom had views like this! 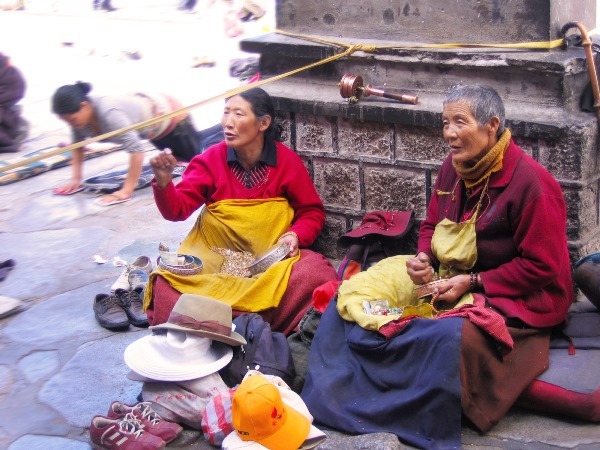 Read more: 7 days in Tibet. When we were in Shigatse having a lunch break and waiting for our guide to sort out our permits, we sat in a park. These two young children popped out of the bushes. They tried to catch our attention by singing and dancing. 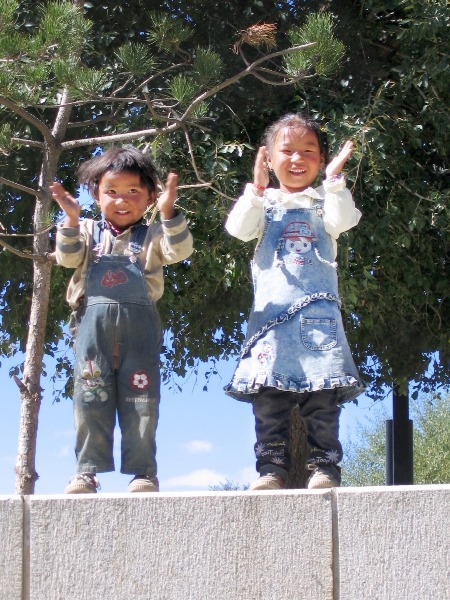 Each time we stood up and tried to approach them, they ran away, giggling with joy. They came back each and every time and even performed a little show for us. Isn’t that the cutest thing ever? In Sakya, we had a little break and looked around. These two girls were working. They cleared some rock from their patch of land. They didn’t mind to pose for us. I love those bright colours as a stark contrast to the grey rocks behind them. We were quite the attraction in Sakya! School was just out while we were waiting and they all welcomed us with smiles and giggles. These boys were pushing each other out of the way to get in the picture. 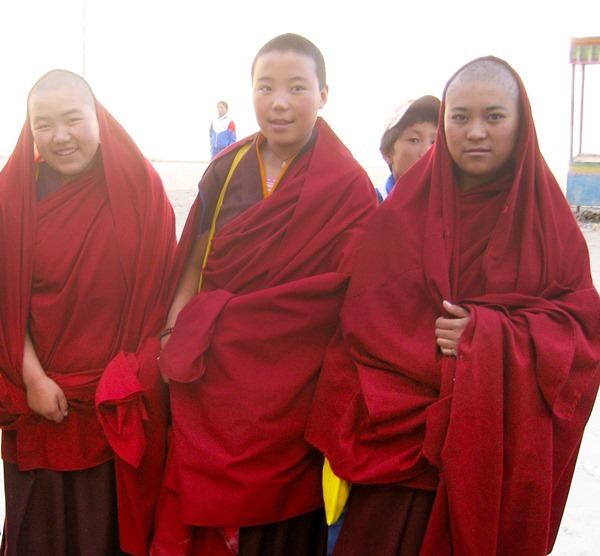 You can’t take pictures of people of Tibet and not include a few nuns. With their red robes and shaven heads, they do stand out in a crowd. These young nuns were so curious and didn’t mind to pose for a picture. If you want to see more images of Tibetan Buddhism, make sure to check out these images of Larung Wuming Buddhist Institute. When we were visiting Mt. Everest Basecamp, we stayed the night at a tent with a Tibetan family. This little boy was our entertainment for the night. He was so little and cute with his big jacket on. He stumbled around in the tent just looking at us with his big eyes and giggled when we looked back at him. 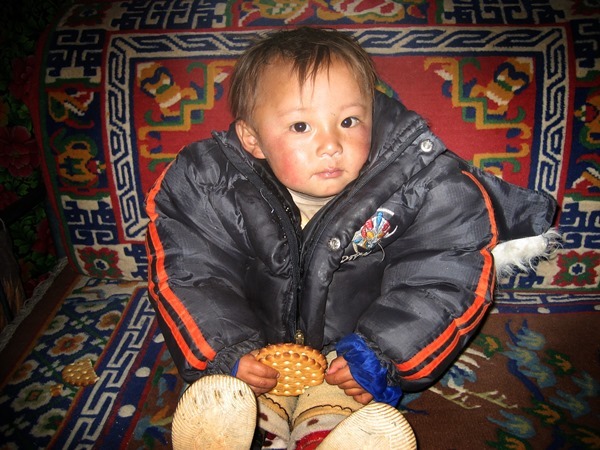 He must be the youngest of my pictures from people of Tibet but he might be the cutest? What do you think? Are looking about more information about hiking in the himalayas? Check out what it is like to hike in Langtang Valley Nepal. Our young guide during the tour. You have to travel by guide around Tibet. 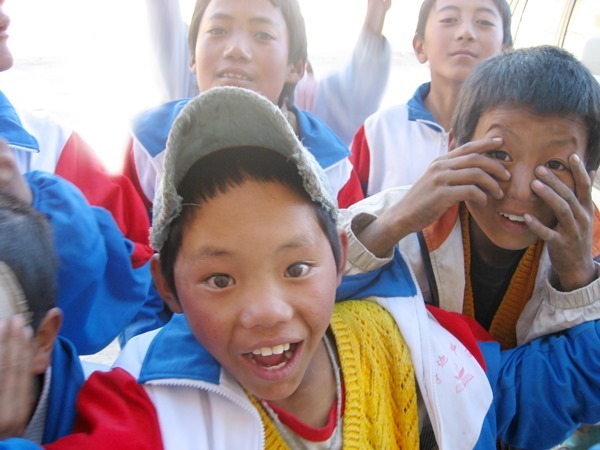 I hope I was able to show you a little bit of the people of Tibet and their faces that tell a story. Young or old, it doesn’t matter. Each of them intriguing and curious. I hope you liked these pictures. Please tell me, which one is your favourite? Amazing portraits! I find it so difficult to photograph people somehow. Tibet sounds fascinating. It is difficult Katie. But in Tibet is felt natural as the people were so curious. I love them all! So beautiful. I wish that I had the courage to take more photos of people when I`ve travelled. They are a lovely momento and really sum up a place and a country. this is amazing! so refreshing to see a post focused on the heart of a place again, the people! Cool post, I’ve never been to Tibet but I spent some time in Nepal last year and absolutely loved it! The people were so friendly and so beautiful, your photos really remind me of them. I like to take photographs of people, but I’m always too nervous to ask if I haven’t already spoken to them. I find children the easiest by far! I also love take photos of hands, I think hands can tell a story! I was nervous every time I took a picture of someone Jessica. Especially if I could just point at the camera and show them the picture afterwards. I love this! I really like taking pictures of people on my travels, trying to figure out their story. Such beautiful photos of such beautiful people! Great post, it makes me think about life and the world a bit. Can you imagine that every person in the world has just as complex of a mind as you. And that if thoughts were something visible, the air would just be clogged by them! Sorry, got a bit deep there haha. You definitely have some incredible images in that collection. Very talented!! Thank you Jess. I’m glad you liked it.